The name of my rug loom is Wee Geordie. It was given that name in jest because the loom is anything but wee. Wee Geordie is the title of a British comedy movie made in 1956. Geordie was a slight of frame, puny son of a gamekeeper in the Scottish Highlands. He got tired of being picked on by his peers and answered a Charles Atlas style bodybuilding ad. Flash forward several years: the little runt is now a strapping, muscle-bound Olympic champion. He becomes the top-ranked hammer thrower at the Highland Games and is chosen to represent he UK in the Olympics at Melbourne, Australia. My loom never started out as puny, but the tongue in cheek moniker has stuck. Here are a couple of photos of the back beams, each of which are 57 inches in circumference. The photo on the left is of the top warp beam and the photo on the right is the bottom warp beam. Their are four ten pound barbell weights attached to arms on the ends of each beam. 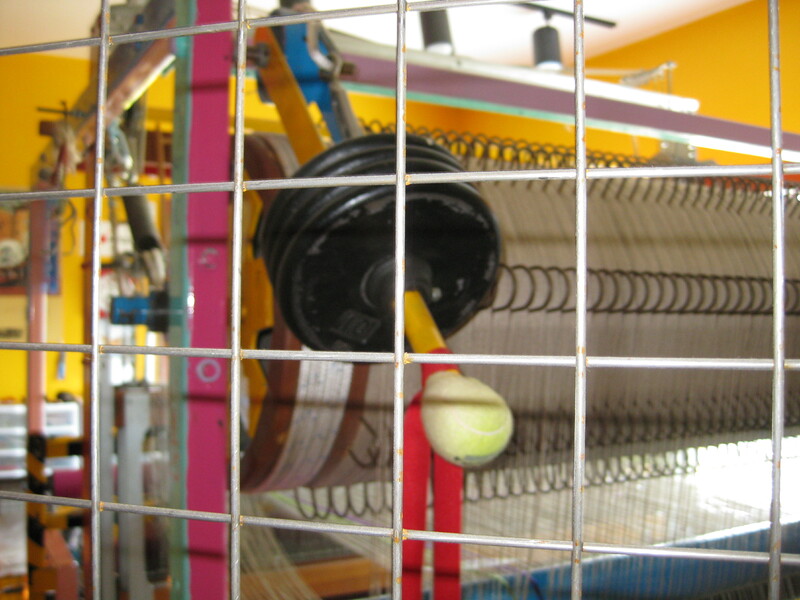 They are part of the braking and warp advancing system of the loom. Note the tennis ball on the tip of the arms; it is not pleasant to bump into the ends of the arms without the tennis ball padding. The red ribbon hanging down is further warning not to venture too close without caution. I speak from experience! The size of the beams allows me to load about 100 to 125 yards of rug warp at a time. That usually lasts me at least two years before I have to reload. 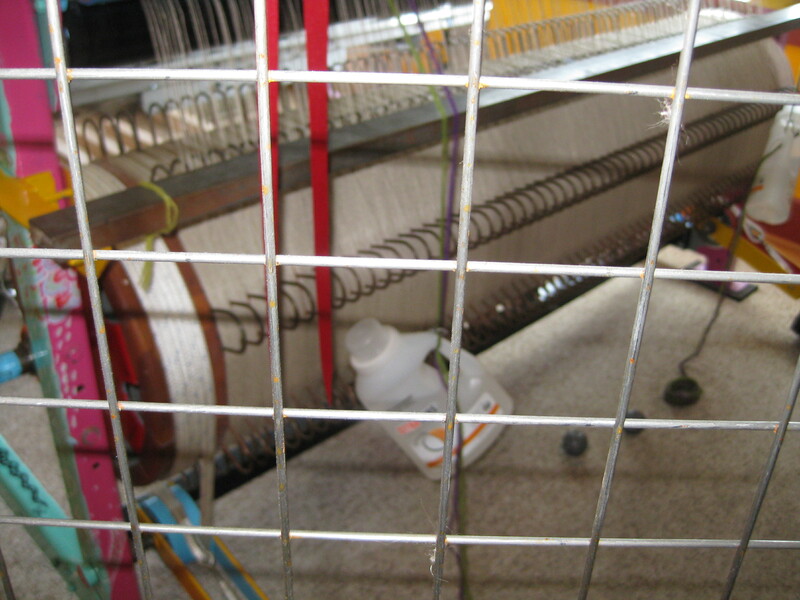 In my next blog post I will explain why there is wire mesh surrounding the loom. 3 Responses to "My Loom’s Name"